I’m struggling a bit with my skincare routine, and it’s starting to show in my face. I’m especially missing my concealer to cover the dark circles and spots. And the spots are abounding. I attribute this to the fact that my skin is a product testing ground at the moment. Every few days I’m trying a different homemade cleanser or moisturizer, and it’s not going well. My new plan will be to pick a couple of homemade products, and try them for several weeks at a time. After all, I do have a whole year to experiment. So, my first ‘stick to it product’ is going to be a homemade toner or astringent. We’re having warm summer weather here in England, and I really need a decongesting product to keep away the greasies. 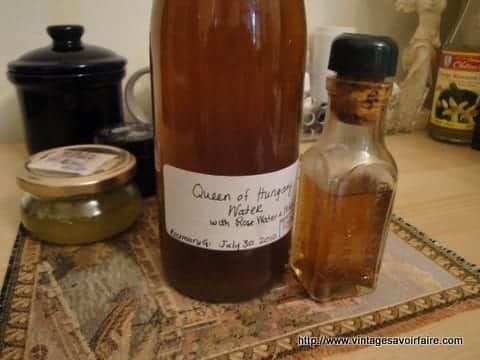 This recipe for Queen of Hungary water has intrigued me for awhile. I found this version in my favorite recipe book by Rosemary Gladstar. Queen of Hungary water is an old gypsy remedy supposedly invented by the Queen of Hungary (and no, that is not her in the picture, that’s the Queen of Greece, but it was a good image!) There are many variations including different herbs in a base of either strong alcohol or vinegar. 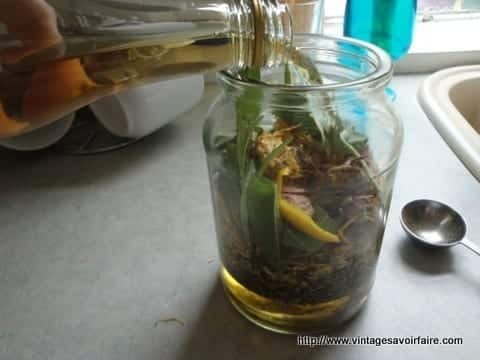 The recipe I used makes an herbal vinegar, and then dilutes it with a combination of rose water and witch hazel. Brilliant! Sounds like it will fix all of my ills. Ok, maybe not, but it should be a refreshing, soothing skin daily skin toner that just might clear up my skin too. Herb Mix: (use whatever you have on hand, I used these below. I used dried herbs for everything except the sage and rosemary, since I have lots of that in my garden). Place herbs in jar. Cover with vinegar until completely submerged. Leave in a sunny spot for 2-3 weeks. Strain out the herbs (you want to get all the bits out – this helps the product keep longer). To each cup of herbal vinegar, add 1c. total extra liquid (I used 1/2 c. rose water and 1/2c. witch hazel). Add several drops of essential oil, if using. Put into clean, pretty bottle. Rosemary Gladstar says this will keep indefinitely and does not need to be refrigerated. How does it smell? Really nice and herby…but slightly vinegary. I can see how it would make a nice body splash if you made it with vodka instead of vinegar. I’ve used it as a toner for a couple of days and it feels refreshing and cleansing on my skin. Will report back after a few weeks of use! 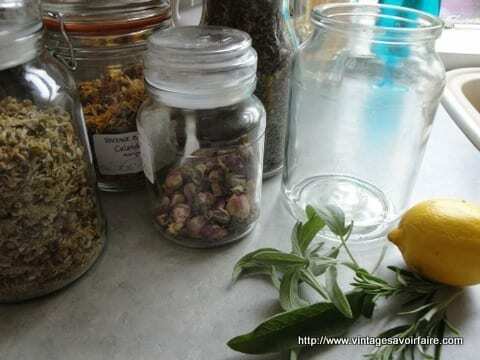 Have you tried any homemade beauty products yourself? Let us know how it went in the comments. But I will add I do use the Gladstar type above. I find it a nice match to my at-home Microdermabrasion kit. Have been using it as a skin toner for a bit now and am really liking it … time will tell if it improves my skin or not though. Wow I am impressed with the list of “ailments” this can cure….coma!! really?